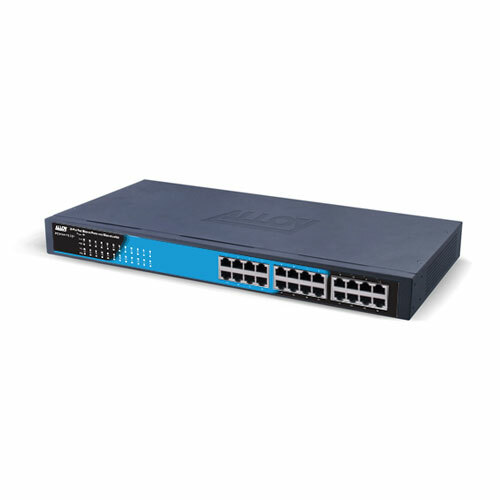 The Alloy POEFE24TV2 is a rackmount switch featuring 24x 10/100Mbps Fast Ethernet PoE ports, fully compliant to the IEEE 802.3at and af Power over Ethernet standards. All ports are auto-sensing, auto MDI/X, allowing easy connectivity to your existing switching infrastructure and PoE Powered Device (PD) such as IP Phones, Wireless Access Points and IP Video Cameras. All ports support up to 30W of power, with the switch supporting up to 220W watts total power – 9W per port at full load. The switch itself is powered by an internal power supply.